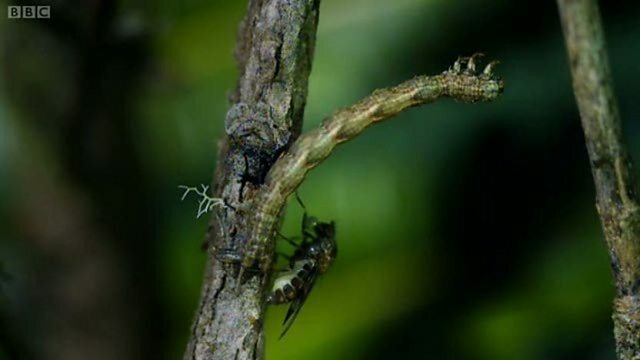 One of the most talked-about sequences from South Pacific, this footage of a carnivorous caterpillar preparing and going in for the attack had never been caught on camera before. Being able to shoot it close up and in super slow motion was an added bonus that makes this tiny insect look like something straight out of science-fiction. Hawaii’s isolation has had a curious effect on the evolution of some of its wildlife. Crawling around the forest ferns are caterpillars. They’re the larvae of a moth and look ordinary enough, but these tiny caterpillars are perhaps the strangest of their kind in the world. When one finds the right spot it settles down to chew through a leaf. So far so normal. But the caterpillar is not actually swallowing the bits of leaf. It’s channelling a gap between the segments. When finished, it’ll tuck itself into the space. So, what’s so strange about this animal? Well, those are not your typical caterpillar feet and what follows is not your typical caterpillar behaviour. This is a carnivorous caterpillar, with a vice-like hold and a bite to match. Hawaii’s numerous fruit flies are just too good an opportunity to ignore. The stick-like camouflage of another kind of meat-eating caterpillar is just as effective when ambushing prey. Nobody knows what set Hawaii’s carnivorous caterpillars on this extraordinary path but it’s the sort of quirky evolution that’s common on isolated islands.